London Fashion Snap Extra, at Lewes Vintage Fair in November. Plus, a basket bag and leather shoes, lovely country winter style! At Jusy's Vintage Fair in November. I like tartan check with simple monochrome style. In her case, her beautiful blonde mushroom cut is also lovely accent of her style. At Judy's Vintage Fair in November. Lovely romantic 1970's maxi dress. Loved the print and puff sleeves! Such a girly style. Have you checked my online store!? However, I have some big market for buying coming up, so I will stock fresh new stocks hopefully. I thought I haven't got any special ones this month.... But, yes, I always have some. Those are my January new stocks. I have got really lovely jewellery. They are already on my online store. 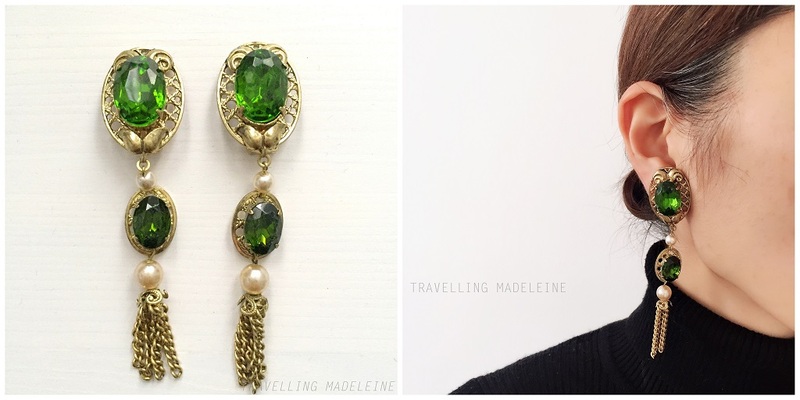 Lovely green bijoux earrings from Weiss. These are no brand, but loved beautiful green bijoux and pearls and gold tassels. These cute enamel flowers and colourful beautiful bijoux are just perfect for spring!! I put it on markets, but also will put on online store too. These simple golden stars are simple design, but you don't really see them actually. Big and chunky, very gorgeous. 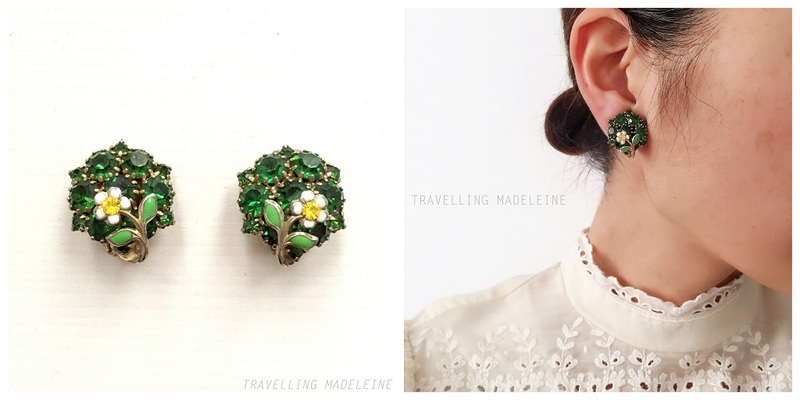 1960's earrings from West Germany. Lovely colours like cherry blossoms. Also, I have got lots of pearls! Pearl festival in my stall! Specially, I recommend a pearl long necklace. Such a simple but useful item..... Must buy. It's close to Valentine's Day, so I will bring lots of jewellery and red rose motif. It will be confirmed tomorrow. Please check my SNS account! Red beret, blue jumper, and white and blue trousers.... she caught my eyes at once!! Love the bright yellow socks too.